Mountain peaks soar, reaching for the sky. Canyons–a palette of earth tones–are peppered with geysers, fumaroles, steam vents, and mud pots. Rushing rivers feed crystalline lakes and mighty forests make a comfortable home for the rich diversity of wildlife in Yellowstone National Park. The wildlife: without a doubt, Yellowstone has the best wildlife viewing in all of North America. The geothermal activity: Yellowstone is home to more geysers, hot springs, bubbling mud pots, fumaroles, and steam vents than the rest of the world has combined. Our insider's access: known only to locals (and of course our guides), we want you to see Yellowstone like a local. Meet in Bozeman and shuttle to the town of Big Sky, Montana, where we will start our adventure with a thrilling zip line tour over the Gallatin River. After lunch we’ll make our way to the west entrance of Yellowstone. Upon arrival to the Upper Geyser Basin we’ll hike in the back way, traversing through an area of bubbling hot springs to the main attraction, Old Faithful. After checking into our home for the night, walk to the historic Old Faithful Inn for dinner and a chance to watch Old Faithful erupt under the stars. Old Faithful Inn: A world-famous landmark opened in 1904, this stone and pine inn features a five-story lobby, views of Old Faithful and classic charm. Old Faithful Snow Lodge: Completed in 1999, the Snow Lodge is the newest of the park’s full service hotels, and features heavy timber construction, exterior log columns and a cedar shingle roof, making it a significant example of classic “parkitecture”. Start the day with a hike through the Upper Geyser Basin to Observation Point for great geyser panoramas. Delight in a tasty guide-prepared picnic lunch. Embark on an extraordinary hike to Storm Point where you will encounter open meadows, shaded lodgepole pine forests, and lakefront trail. Check into Lake Lodge Cabins with time to relax before dinner in the historic dining room of Lake Hotel. Lake Lodge Cabins features a main lodge with a large porch offering a spectacular rocking chair view of Yellowstone Lake. The main lodge is constructed of logs and is the focal point of this classic and comfortable building. Located behind the lodge are rustic cabins just a short walk away from Lake Hotel and the lake itself. Each cabin is simple, spacious, and modernly furnished with two queen beds and private bathrooms. The main lodge houses a delightful lobby where two fireplaces, a lounge and gift store warmly beckon guests to linger and chat. Ogle over water flowing powerfully over the Brink of the Yellowstone River’s Upper Falls followed by a delicious picnic lunch. This afternoon we’ll set off on a hike on the Wapiti Trail. This trek brings you to the rim of the 10,000-year-old, 1,000-foot deep Grand Canyon of the Yellowstone River. As you carefully make your way back along the canyon wall, you’ll “ooh and ahh” around every bend as the pinks, yellows, reds, and oranges of the rock appear all the more bright as you walk to the grand finale of Artist Point, the most spectacular viewpoint of the Lower Falls of the Yellowstone River. Enjoy a special BBQ dinner tonight. Wake early to catch the sunrise and prime wildlife viewing on a scenic drive with your guides. Upon returning back to Canyon, enjoy a relaxed morning and breakfast before driving over Dunraven Pass to Mammoth Hot Springs where we’ll enjoy a delicious picnic lunch. Explore the beautiful terraces of Mammoth Hot Springs on a backcountry trek. Dinner is on your own tonight in Gardiner. This Best Western is located in Gardiner, Montana just outside the north entrance of the Park on the banks of the Yellowstone River. Within walking distance to just about any restaurant in Gardiner, this is the perfect accommodation to spend a night on your own exploring small town Montana. After a day on the trails, enjoy a comfortable bed and the whirlpool tubs or sauna. Enjoy a short morning hike in the backcountry behind the Mammoth Terraces. Lunch at a nice picnic spot, followed by a drive through Paradise Valley to the Flying Diamond Ranch. Saddle up for an unforgettable horseback ride into the Absaroka Mountains alongside fourth generation ranchers. Head to the historic Chico Hot Springs Resort for a soak in rejuvenating mineral waters. Gather tonight in the resort’s dining room for a gourmet dinner in one of Montana’s finest restaurants. 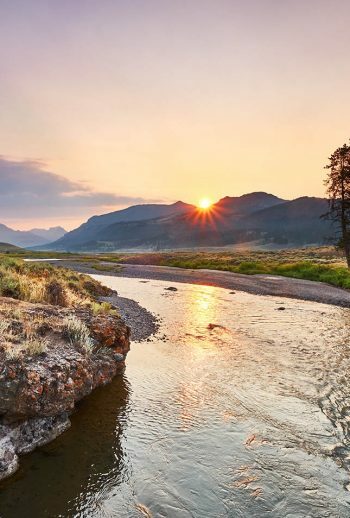 This historic resort is located in the heart of Paradise Valley, just north of Yellowstone National Park and nestled in the foothills of the breathtaking Absaroka Mountain Range. Chico offers an extraordinary variety of accommodations, exceptional dining, outdoor adventures, live entertainment, ultimate relaxation, all with a warm smile and welcoming spirit from their friendly staff. Sleep late and enjoy a leisurely morning at the resort. Stroll the gardens, take one last soak in the hot pool or opt for a scenic hike before returning to the Bozeman airport or your post trip hotel. Learn the issues surrounding the reintroduction of the Grey Wolf into the American West through multiple perspectives. Explore the Yellowstone Caldera and witness the greatest concentration of geothermal features on the planet. Check off the wildlife on your list as you cruise through Hayden Valley on the lookout for bears, wolves, elk, bison, pronghorn, coyotes, bald eagles, and much, much more. Hear the many sounds surrounding you in the Upper Geyser Basin geothermal area: dripping, popping, gurgling, burping, and splashing are just a few noises that will delight your ears! “Walk on the moon” as you hike the white covered rock section of Wapiti Trail, listening for the hiss of a fumarole. Discover why wildfire is an important part of Yellowstone’s ecosystem and how its lodgepole pine forests are adapted to such extreme conditions. Parents, taste the delectable cuisine of Chico’s exquisite dining room, indulging in such dishes as the Beef Wellington, Gorgonzola Filet Mignon, or Ravioli Tosca while your kids experience an Austin Adventures style pizza/pool party. Stare 1,000 feet down at the frothing, whitewater of the almighty Yellowstone River in the V-shaped chasm of the Grand Canyon of the Yellowstone. Come play in Big Sky Country in Montana and Wyoming with the experts in adventure travel! Austin Adventures guides are experienced facilitators and regional experts. They will take the time to explain the details of each activity, answer any questions and demonstrate the use of all equipment. Each activity has been carefully planned to include options for all levels. Most importantly, Austin Adventures guides will help you select the distance that’s right for you. Please plan on arriving at least one day prior to your trip departure. Day one of your itinerary starts at 8:00 or 8:15 am, depending on your hotel. Your trip ends with a drop-off at either the Bozeman airport (12:00 pm) or your Bozeman hotel (12:30 pm). Please make flights for 1:30 PM or later.